Libby's Little Addiction: From Courtney's Closet #48 - Roundup! From Courtney's Closet #48 - Roundup! 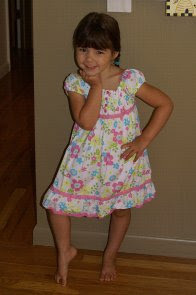 This was last week's From Courtney's Closet inspiration - a SERIOUSLY CUTE photo of sweet little Mattea, daughter of stamping superstar Maria Gurnsey, visiting us for a playdate! Needless to say that photo inspired several stampers to get their creative juices flowing! First of all - I was THRILLED to get a comment from The One And Only Susan Roberts (aka Rainy) saying that she played along. EEEEEEEEEEEK! One of my favorite stampers in the entire universe. So exciting!! And just look what she created - wowsa!! Soooo pretty. But of course. Why wouldn't it be? 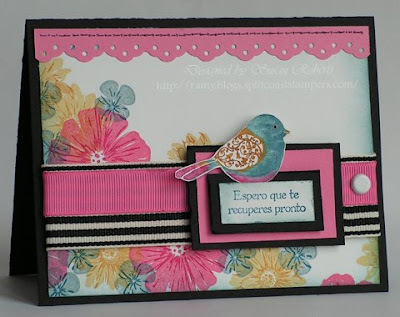 :-) Caryl knew just what to do to make Maria love her card - look at that gorgeous gingham ribbon!! Love it! 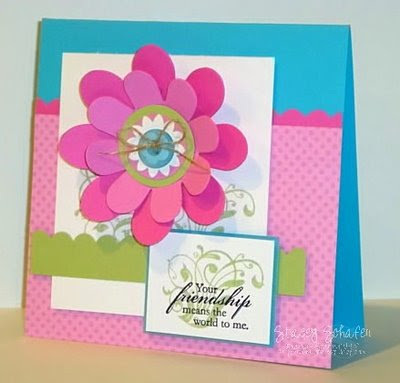 Stacey is an absolute expert at adding big, gorgeous flowers to her cards. This is such a beauty! And speaking of big, gorgeous flowers - I love the one Ella added to her card as well! Not to mention that sweet butterfly! So happy to have you back, Ella! Hip hip hooray!! Kim played!!! I've been waiting and waiting. 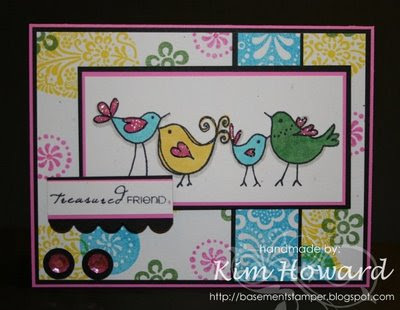 ;-) I just love her card - those birds are too much fun! And holy toledo, Karen is on an absolute ROLL! She played AGAIN! 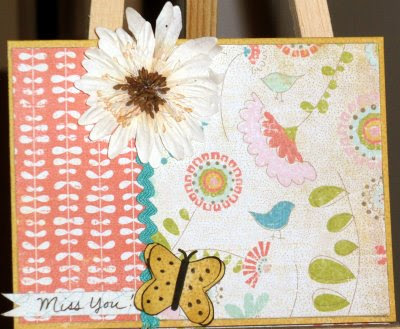 Love the big flower stamps on her card, sooooo pretty & fun! Picking a favorite this week was extremely difficult, every single card is fantastic - but I have to say I did love Sue's the most. Those buttons are just way too pretty, and I love the fun flower background she chose. I'll email you Sue, I think I owe you a few things now... :-) Now go and show these ladies some love on their blogs! Thanks everyone for playing, and thanks again to Maria for sharing such a sweet photo with us! I love this grouping of cards!! Everyone did a great job!! Hey Libs...thanks for the high five! 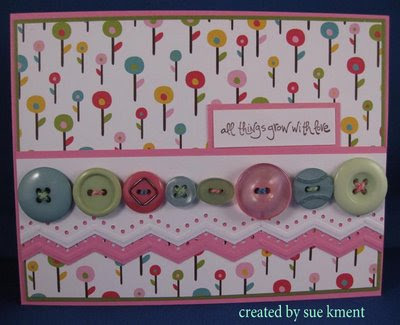 Lots of wonderful cards this week...and Rainy...wooohoooo I have to tell you I made this in mind to send to my #1 baby, who just announce she is growing me a new grandbaby!I am so jazzed! What a fun bunch of cards. I'm so glad I could help stir up the creative juices. Thanks for letting my play along Libby :) You are TOO SWEET!